As I wrote on ELL’s blog this morning, we hosted noted e-lit authors and theorists Michael Joyce and Carolyn Guyer yesterday in the lab. 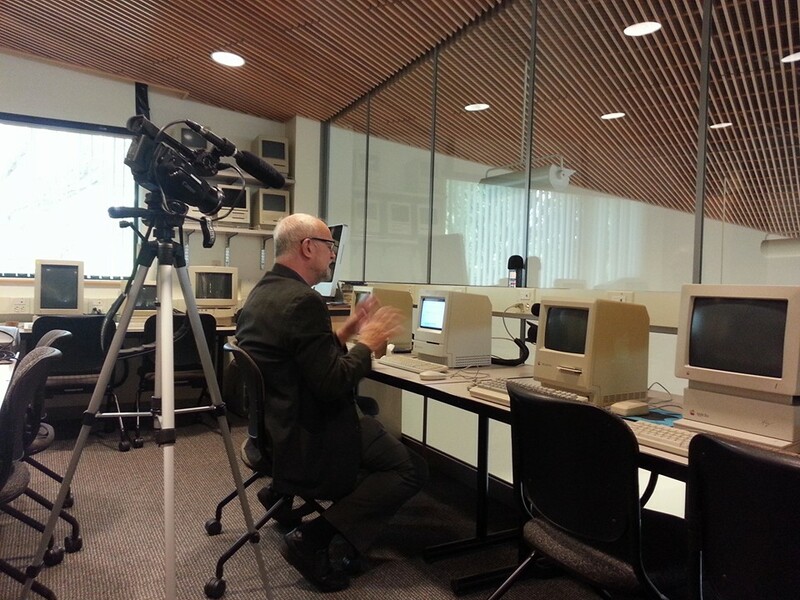 Joyce read from his 1987 hypertext novel afternoon: a story, and both he and Guyer talked about their involvement in the early development of the field. Additionally, Joyce and Guyer walked the audience through items from both Marjorie Luesebrink’s and my archives and provided background and context on the works and events they represent. We documented over two hours of conversation and plan to include it in the upcoming Pathfinders, Volume 2. There are four different versions of the folio that contains the diskette, and one version of the cover for the CD jewel case. I am missing the first version in my collection. Once he described it to me, I recalled seeing it at some point of my career. If you Google the title, the image of this version does not appear––in fact, only two of the four do: numbers 2 and 4. The symbol on version 2’s folio front (and perhaps on version 1––I don’t know since I do not have access to it) represents the yoni, the Hindu symbol of the womb. 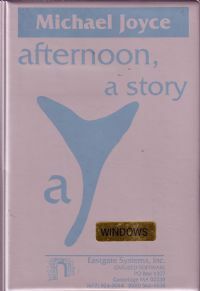 afternoon: a story, according to Joyce, is, among many things, an exploration of women and man’s relationship to them. The 3rd version of the folio contains an anomaly: the work’s title is capitalized. Joyce does not know why it was. He stated that his intention was for the title to be represented uncapitalized. While it is a cardboard folio fashioned with the same design as version 4, it differs from the 4th version in that it consists of a white background instead of a blue one. Joyce created the art for the opening screen himself, using MacPaint (he believes) and repurposing an image of reporters filing out of the Pentagon. When asked about the novel’s inclusion in the Norton Anthology of Postmodern Literature, he said that he found the notion of a postmodern classic to be “ironic.” The Norton’s website, consisting of only 10 lexias of the novel, was not working when I tested it yesterday. In afternoon: a story Joyce pays homage to hypertext author and theorist Jane Douglas. He pointed out in his comments about Douglas that she viewed the lexia, “The Lady or the Tiger,” as the pivotal one in the novel. He also referenced his collaborator Jay David Bolter in the lexia entitled “Turing’s Run”––an obvious allusion to Bolter’s book Turing’s Man. I should have known this bit since I read the book when I was a grad student years ago. Interestingly, he found a typo yesterday in the lexia, “Peter, Peter,” that he had never noticed before. I will see if it appears in the other versions I have in my library and report back. He wrote afternoon: a story in Jackson, MI. He remembers the sounds of winter he describes in the opening screen’s text. He also said he wrote inside the computer, meaning that he did not write out the plans and text first on paper and then build them for Storyspace. All of these comments will appear in the documentation video. As we did for Pathfinders, Volume 1, Stuart and I will make the rough cuts of the videos available as soon as possible.